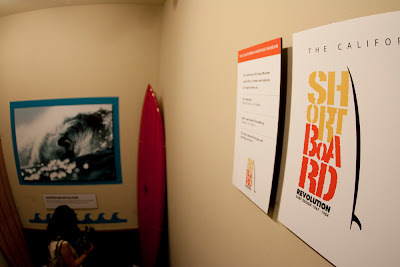 : Board Collector: Short board revolution. Surf Design from 1967-1984. Short board revolution. 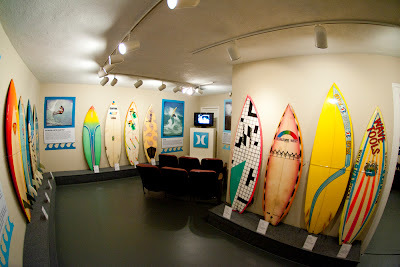 Surf Design from 1967-1984. 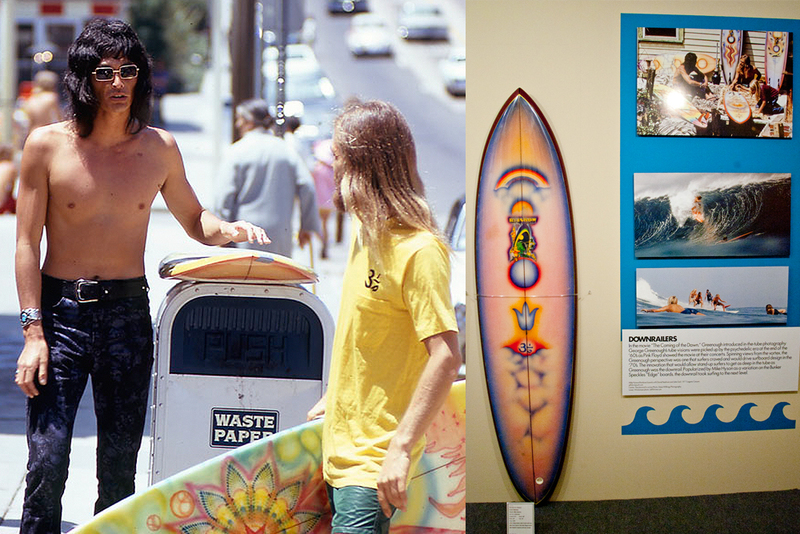 The exhibit was curated by Nathan Pratt, surfer, shaper of boards, and one of the original “Z Boys” of 1970s skateboarding fame. Several of Pratt’s creations are on display as well as other surfboards from Zephyr/Horizons, formerly located in Ocean Park on Main Street. 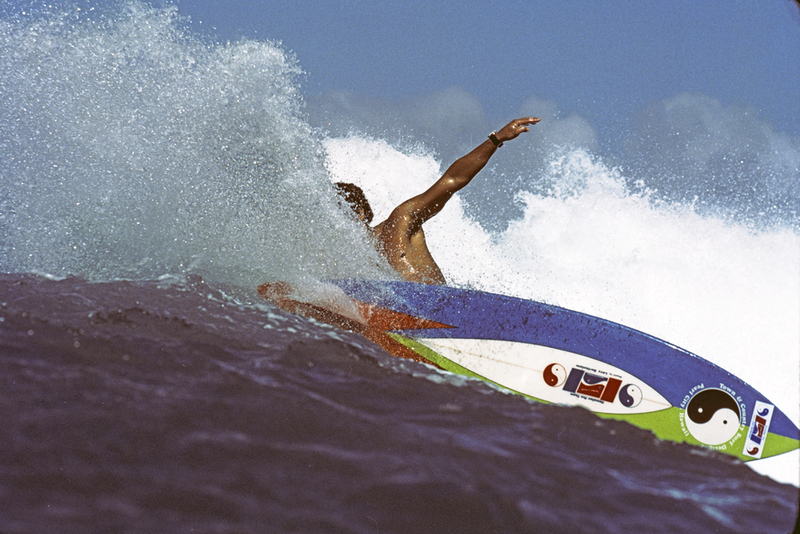 To best appreciate the structure of surfboards, one should know a few surfboard terms. 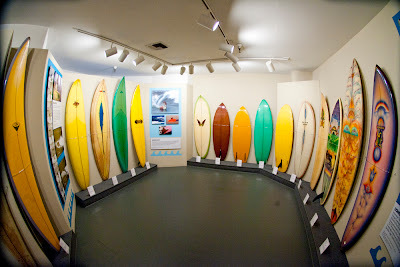 A surfboard’s anatomy is divided into the “deck” (the top of the board which the surfer rides on), the “bottom” (the underside of the board where the fins are located), the “nose” (top 12 inches of the board) and the “tail” (bottom 12 inches). A “gun” is a medium length board (7—12 feet); a “short board” is between 5’5” and 7 feet; and a “long board” is a single fin board with a round nose, 9 to 12 feet. Early surfboards were usually made from balsa wood and were plain-looking and bulky. 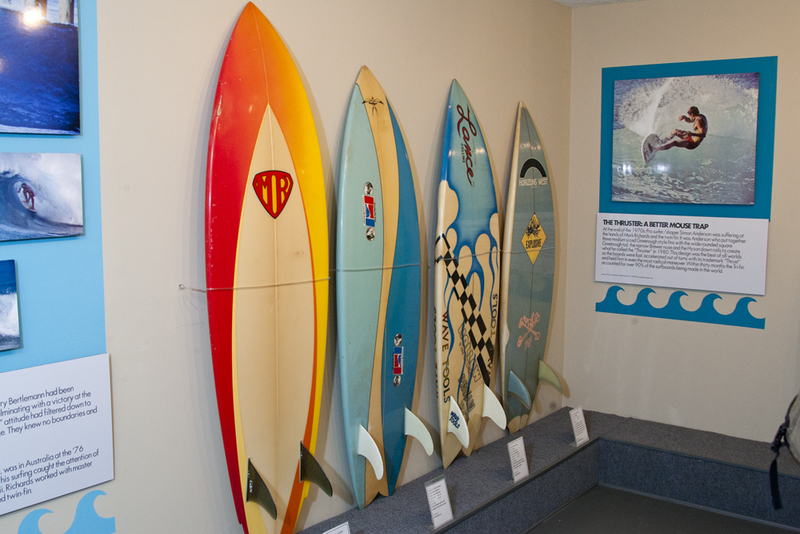 During the 1960s, fiberglass foam became the standard material for boards. “Shortboard Revolution” displays a 1967 fiberglass board, designed by surfer Mickey “Da Cat” Dora for Chris Green. With a high aspect fin, this “gun” was made for the powerful waves of Hawaii. 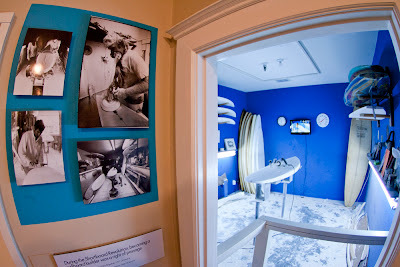 The “Revolution” began in the mid-1960s with Australian surfers discovering American surfboard maker George Greenough’s shorter boards that could enable a surfer to make radical turns and move faster. 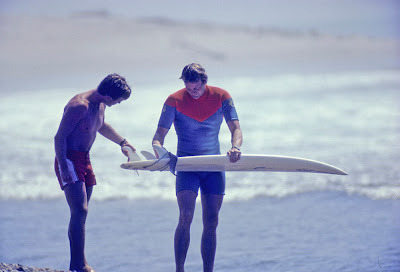 (California surfers then picked up on the boards being used in Australia, ironically designed by one of their own). On the wall hangs a rather short red board, personally owned by Greenough, called the Velo SS. 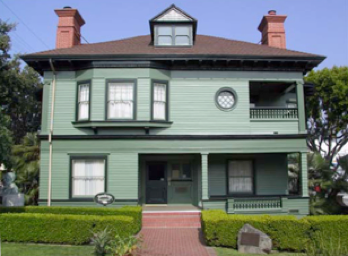 It doesn’t look like much but its design influenced everything that came after. Next came “Roundtails” in 1968. These boards shook up surfboard manufacturing as the new style caught on while stores were still stocking the former models. 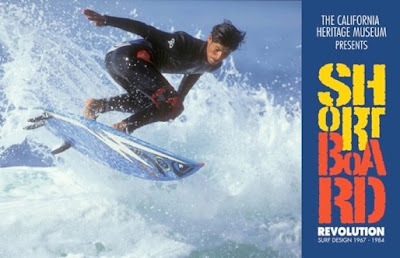 A beautiful example is the Harbour, by Revolver Roundtail, a 7’ 6” board with a multi-colored “acid splash” graphic style. 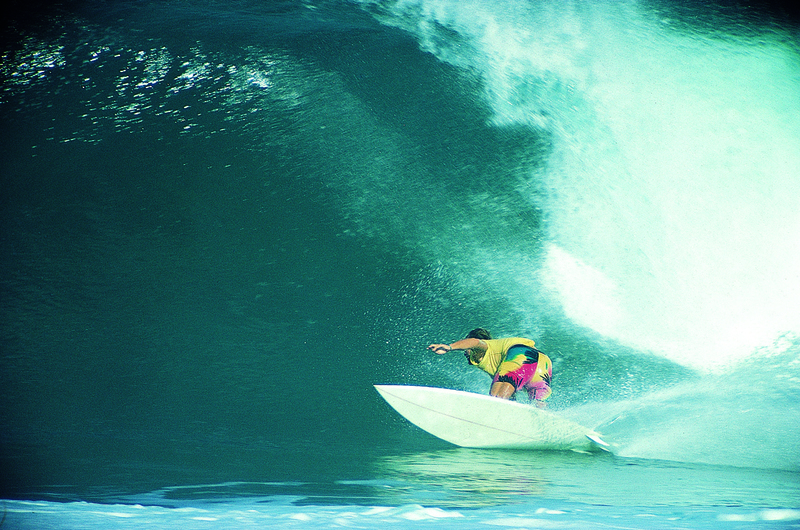 Supershort boards, called “pigs” or “slabs” in Australia, were in demand for smaller waves. Con’s “Butterfly” model is a good example of a supershort, at 6’ 6” with a butterfly decal painted on its front. 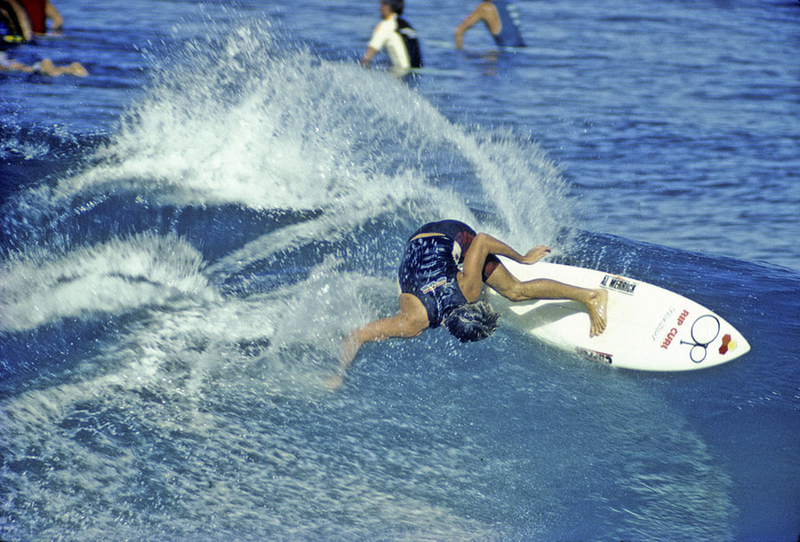 More styles came and went during the 1970s as local shapers and manufacturers also created boards that were a delight for the eyes. 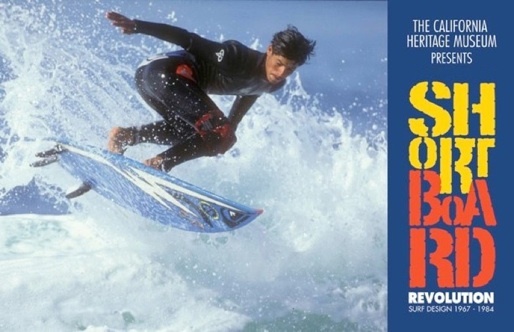 Zephyr Productions, founded in Santa Monica by Jeff Ho, featured the airbrush artwork of Craig Stecyk, as in the exhibited model “Skipper Boy” that combines a design of stars, clouds, an eye pyramid, and a Navajo icon by the nose. 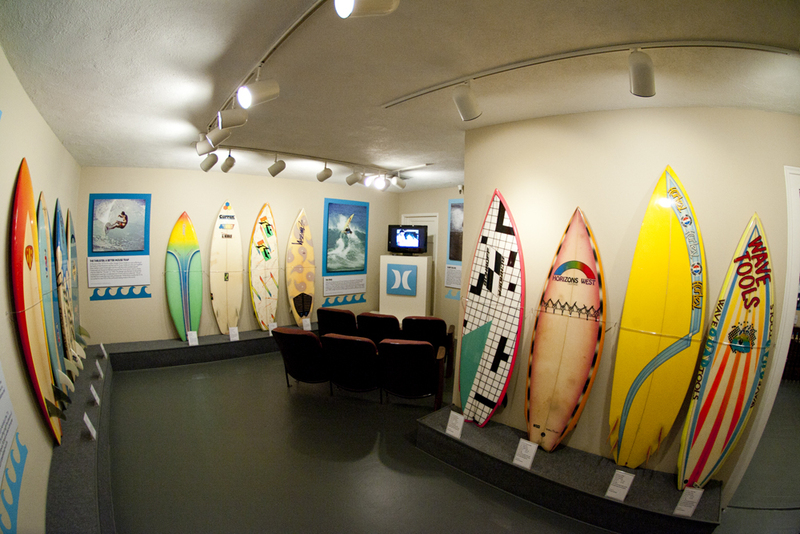 Later boards on display chronicle the evolution of two and three-finned boards, “wings” on boards, the 1980s “Thruster” by Simon Anderson that combined features of several types of earlier boards, and the super-short, high performance “aerial” boards created by Horizons to accommodate the new surfing style influenced by the Z-Boys skateboarding techniques. 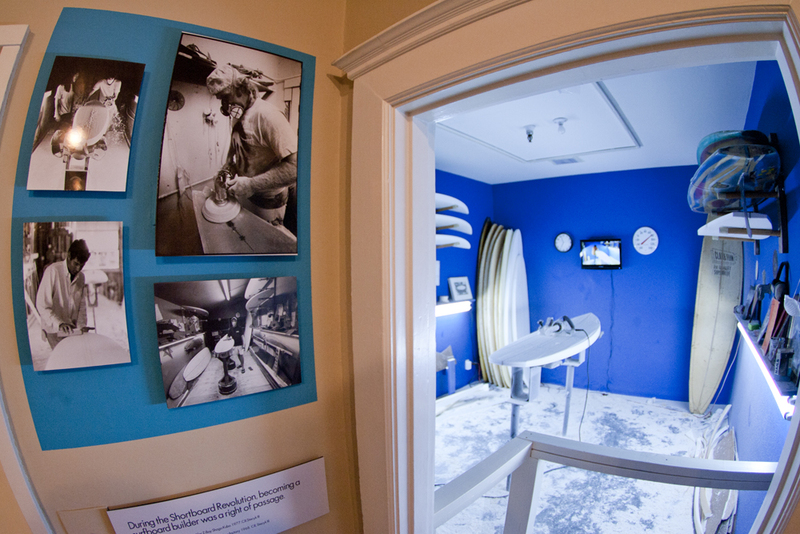 The Heritage exhibit also features a recreation of a surf shop “shaping room” with sawdust on the floor and lights at the sides to allow the shaper to see imperfections on the boards. The exhibit’s beautiful catalogue contains a description by Nathan Pratt of how a board is shaped. There is a second exhibit at the Heritage, “Aloha Spirit,” where you can see furniture and artifacts influenced by Hawaiian culture—including some rather kitsch lamp bases in the shape of hula dancers (some of them even hula). 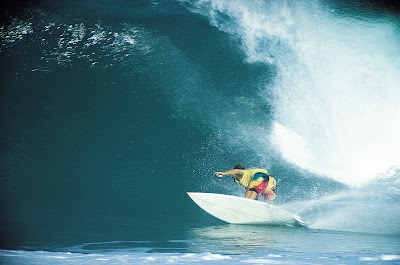 All in all, “Shortboard Revolution” and “Aloha Spirit” will make you want to cry “Cowabunga!” even if you don’t surf. 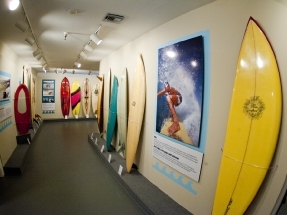 Shortboard Revolution and Aloha Spirit, through April 22, 2012, California Heritage Museum, 2612 Main Street, 310.392.8537. The dark haired surfer is David Nuuhiwa. The blonde is John Gale, also a surfer and one of the biggest drug dealers in Laguna Beach. He was part of the Brotherhood of Eternal Love - distributing drugs smuggled from the middle east in surfboards back to California. He died in an automobile accident.